Do your SDRs often remark about how much they love using Salesforce? Do they feel bad for peers at other companies with poorly configured CRMs? Are they thankful that, unlike those poor sods, they aren’t drowning in manual steps and byzantine processes. I suspect this isn’t a sentiment you hear very often. I’ve asked dozens of SDRs to describe the experience of doing their jobs inside Salesforce. The responses ranged from “death by a thousand cuts” to “running in mud wearing cement shoes” to “sitting in the dentist’s chair five days a week.” I once heard “it’s fine” and considered that rather high praise indeed. For all the attention and buzz the SDR role has received, the way companies support sales development in Salesforce hasn’t advanced much in the last 10 years. Where AE, managers, and senior leaders have been drowning in innovation and improvement, SDRs have been logging clicks and filling fields in ways that would be entirely familiar to a time traveler from 2008. So I wrote a book about fixing it. Lightning Sales Ops was just released. 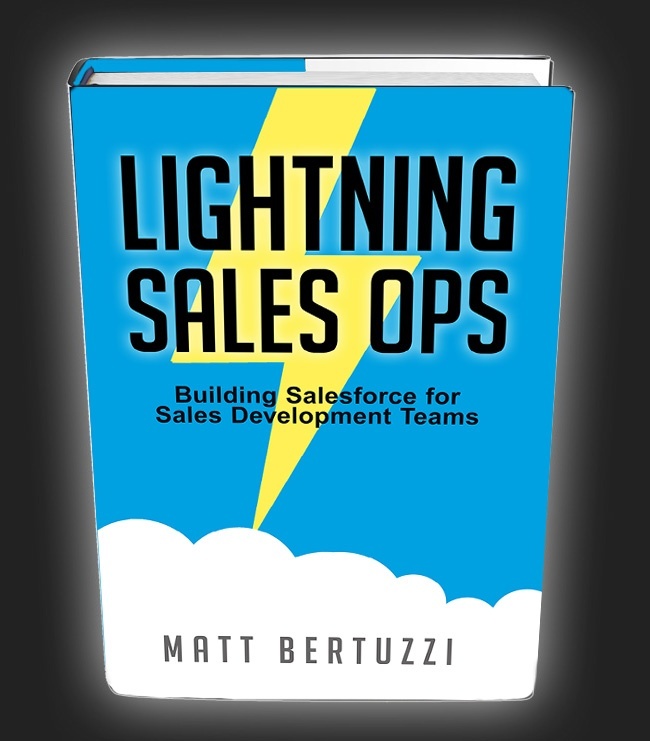 I interviewed 34 sales executives, SDR leaders, marketers, operations pros, and Salesforce admins for this book. I hope the stories, strategies, and thinking I share will inspire you. IDENTIFY: Focuses on getting the right prospect to the right SDR at the right time. PLAN: Presents stories and approaches for shortening the distance between valuable context and your reps’ fingertips. We’ll go deep on building pre-call planning into Salesforce. CONTACT: Offers a roadmap for making Salesforce workable for SDRs. These chapters are filled with actionable advice for tracking outreach, implementing a cadence process, and measuring results. QUALIFY: This section is all about the passing meetings from SDR to account executive. Handoff, qualification criteria, and acceptance processes are discussed in great detail. REPORT: Switches gears and present strategies and examples for measuring sales development impact. There’s a lot to learn about dashboards for executive management, marketing, first-line managers, and the reps themselves. So those topics are covered in depth. I'd been kicking around the idea for this book for the last 6 years and I learned quite a bit along the way of writing it. If you’d like a quick preview, you can download an excerpt.